Contaminated water can instantly ruin that vacation youve been planning or mark an end to an otherwise great time outdoors. Whether traveling abroad or in the field hiking or backpacking, you need access to clean and safe drinking water. The next time you leave the house, dont just pack any water bottle. 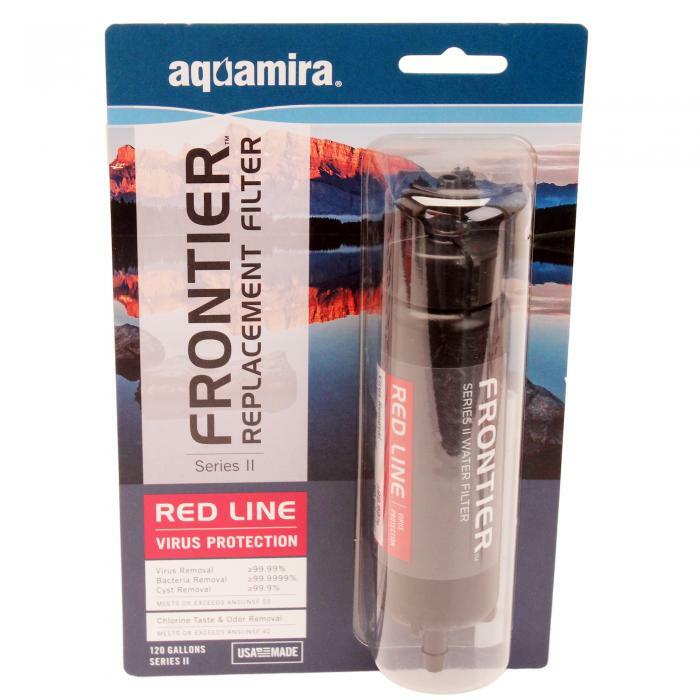 Instead grab the Frontier Filtered Water Bottle by Aquamira®. The Series II Green Line replaceable filter removes greater than 99.9999% of bacteria, Cryptosporidium, Giardia, chlorine, bad tastes and odors. When heading abroad or to areas prone to viruses, our Series II Red Line replaceable filter offers added virus protection. With the best flow rate (500 ml/minute) of any water filter bottle on the market and an ergonomic design, gaining access to clean drinking water has never been so easy. When you need more than just great tasting drinking water, turn to the newly re-designed Frontier Filtered Water Bottle by Aquamira. • Designed for use with any Frontier Flow Water Bottle.